You should not operate a motor vehicle under the influence of anything. It’s not safe, it’s an unnecessary risk and it selfishly imposes risk from your behavior on other people who had no choice in the matter. At the same time, it’s hard to make an argument for behavior that is not harmful or quantifiably risky enough to be penalized. Such is the conundrum when it comes to issuing cannabis DUIs. Testing for THC levels in a way similar to how blood-alcohol breathalyzers measure intoxication has proved fruitless, if not impossible. THC is fat-soluble, alcohol is water-soluble. THC metabolites stay in the body long after THC has stopped dancing on the brain. And such is the reasoning behind the recommendation emerging from a two-year review of how to address roadside “marijuana DUI” testing in Michigan: Don’t do it — or at least, don’t do like you do with alcohol. According to the Lansing State Journal, a two-year review from the state’s Impaired Driving Commission has recommended to Gov. Gretchen Whitmer and the state legislature that Michigan set “no limit” for how much THC a driver can have in their blood. Instead, if the recommendations from the expert panel are adopted by lawmakers and obeyed by law enforcement, police would be able to enforce DUI laws in a more old-fashioned way: by observing driving patterns and giving drivers a roadside sobriety test. In fact, this is a thing police are already doing in other states, successfully. According to experts, the level of THC metabolites in a person’s blood is simply not related to their level of impairment. It’s a number that means something else. And arbitrary THC limits set in other states are wholly unscientific. Thus, “the only reasonable way to do this right now is to demonstrate that people are impaired” through roadside sobriety tests and observing erratic driving, said Norbert Kaminski, professor of pharmacology and toxicology at Michigan State University, in an interview with the Lansing State Journal. Standard field sobriety tests include following the movement of a light or an officer’s finger with your eyes, walking a line heel-to-toe for nine steps and returning, and holding one leg up six inches in the air for 30 seconds. According to recent research, these tests work as an accurate measure of sobriety — or lack thereof. The recommendation comes a few months after Michigan voters legalized recreational cannabis. Medical cannabis has been legal in the state since 2008. Complaints from police about roadside safety and apocalyptic visions of stoned drivers reducing the morning commute to a game of bumper cars set to an Afroman soundtrack are, by now, a predictable verse in the rhythm of the cannabis legalization debate. Some states have tried to ameliorate these concerns by treating cannabis like alcohol — just like the legalization line would have us do — and have determined that a certain level of cannabis metabolites in the blood determines intoxication. But this “solution” has just caused more confusion. In both Washington and Colorado, that threshold is 5 nanograms per milliliter of blood. But, as state officials have admitted, that number is arbitrary and “not backed by scientific theories.” This has caused a level of chaos… But not on the roads. In courtrooms, judges and juries have been increasingly unconvinced by police assertions of marijuana-induced impairment. At the same time, law enforcement has proven perfectly able to arrest and prosecute drug-impaired driving cases absent an ironclad, quantified level of intoxication and instead based on driver behavior. If Michigan lawmakers listen to the experts, they’ll have to pass a law that does not include a limit for the amount of cannabis drivers are allowed in their bloodstream while on the road. Current state law is zero-tolerance for any level of THC in the body for a driver, according to the State Journal — But the chance that such a case would hold up in court is even slimmer now, given the state panel’s finding that such a threshold makes absolutely no sense. How Michigan Plans to Breathalyze for Marijuana DUIs… It Won’t was posted on Cannabis Now. Does Marijuana Work for Parkinson’s Disease? Every year, more than 200,000 Americans are diagnosed with Parkinson’s disease, a neurological disorder that causes stiffness, tremors, and affects both a person’s ability to speak and to walk. Specifically, Parkinson’s is a degeneration of dopamine neurons in the brain. It’s a debilitating disease for which there is no one known cause (it could be genetic, it could be environmental) and for which there is no known cure, only treatment to manage symptoms. There’s enough of a chance for 80 percent of Parkinson’s patients to report trying cannabis to soothe symptoms (including with official approval from some states’ medical marijuana laws) which means there’s enough of an interest to draw attention from the Parkinson’s Foundation. As Denver-based altweekly Westword reported, the 62-year old research foundation will host its first-ever medical marijuana conference in Denver on March 6 and 7. In a way, this is a search for a new answer to a very old question. As cannabis researcher Ethan Russo noted in a recent literature review, researchers as earlier as 1888 observed possible benefits for Parkinson’s patients using cannabis — or, then, “Indian hemp.” Things haven’t advanced much since then. But what data is out there? Here’s a brief review of published research on the topic. According to results of a study published in the journal Clinical Neuropharmacology in 2014, 22 patients with Parkinson’s reported “significant improvement of sleep and pain scores” after smoking marijuana. More notably, “[n]o significant adverse effects of the drug were observed,” according to the researchers — who called for a larger study to verify the results. But that study’s participants were observed back in 2011-2012. That wasn’t so long ago, but it was well before the public at large (and even most marijuana users) had the fluency around cannabinoid contents and terpenes that they do today. What about CBD-only treatments — or what kind of CBD-THC ratio? A 2004 study found “no significant benefits” on 17 patients trying a THC:CBD oral extract. Yet two other studies found that CBD helped five Parkinson’s patients with psychosis and 21 more patients with general symptoms. Possibly the largest recent study in recent years was a 339-person research effort in the Czech Republic, where patients received oral cannabis leaves. Here, the best results came in patients who took the treatment for “three or more months,” Russo wrote in his review. Keep in mind that current treatments of Parkinson’s have adverse side effects including dyskinesia. 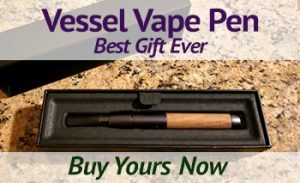 As with most medical questions involving cannabis there are currently more questions than answers on what Parkinson’s can do. More important than the potential there’s the fact that Parkinson’s patients are trying marijuana on their own. As usual, medicine is waiting to catch up as soon as the law will let it start to try. Does Marijuana Work for Parkinson’s Disease? was posted on Cannabis Now. US Surgeon General Jerome Adams recently used his official Twitter account to make a startling claim: Contrary to the promises made by criminal-justice and drug-policy reform advocates, he said, the era of legal adult-use cannabis has actually led to more people of color being arrested. DYK that in most states that have legalized adult use of marijuana, arrests of people of color have actually increased? Social justice is important to address, but also important we evaluate actual outcomes and not assume legalization automatically = social justice. The Feb. 23 tweet triggered immediate backlash from academics and researchers as well as cannabis-reform advocates, who pointed out a fundamental problem with what the country’s chief medical officer broadcast to his roughly 584,000 followers: It’s just not true. Not at all. In Colorado, marijuana-related arrests decreased by 52% between 2012, the year voters legalized recreational marijuana, and 2017, according to a much-anticipated state Department of Public Safety report released in October. Figures from other states reflect a similar phenomenon: There are far fewer people arrested for an activity that is no longer a crime—a fact that is true across racial lines. 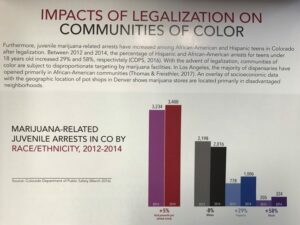 “The number of marijuana arrests decreased by 56% for Whites, 39% for Hispanics, and 51% for Blacks,” according to the Colorado report. 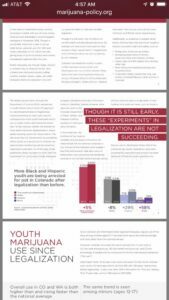 These statistics nevertheless reveal a persistent problem: Racial disparities in cannabis arrests remain. Just as before legalization, a disproportionate number of black and Latino people are arrested for marijuana crimes compared to whites—meaning legalization has solved neither racism nor racially biased policing. Maybe that’s what Adams, who is black, actually meant? Apparently not: On Feb. 26, Adams posted a follow-up tweet clarifying that he’d meant what he said. And with that, Adams went from merely mistaken to ideologically incorrect. To support his claims, Adams, who was appointed in 2017 by President Donald Trump, tweeted slides from a presentation prepared last year by Smart Approaches to Marijuana (SAM), a Washington, DC–based advocacy group that opposes cannabis legalization. Over the past several years, SAM has earned a reputation for opposing medical and adult-use legalization at all costs—truth and data among them. The organization has been repeatedly accused of misrepresenting facts or cherry-picking data to paint as dire a picture of legalization as possible. Other spurious claims made by Project SAM or its cofounder, Kevin Sabet, a former official in the Office of National Drug Control Policy—which is not a science-based office but an agency mandated by Congress to oppose marijuana legalization—include the patently false assertion that marijuana legalization leads to fentanyl-laced cannabis, a claim made to Kentucky state lawmakers, and the equally bogus assertion that there is a causal link between marijuana legalization and homelessness. In 2017, SAM agreed to pay thousands of dollars in fines for violating California campaign finance law after failing to disclose special interests who helped fund the group’s opposition to Proposition 64, which legalized adult-use cannabis in the state. Shadowy origins aside, the data tweeted by Surgeon General Adams have also drawn fire from public health and policy experts. As noted by Renee M. Johnson, a professor at the Johns Hopkins University Bloomberg School of Public Health, Adams’s claim about arrests rates seems to rest on an assertion made by SAM regarding arrest rates specifically of black youth. The same can’t be said with respect to all black people, nor all people of color. 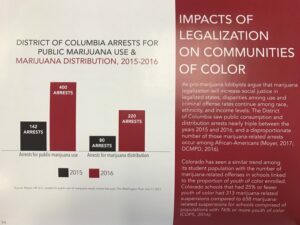 In Colorado, for example, the number of black youth arrested for marijuana—which, to be clear, remains illegal for minors—increased from 205 in 2012 to 324 in 2014. That’s an increase, yes. But even that claim falls victim to serious problem that renders the data all but worthless, except of course to foment fear and confusion on Twitter: The state data was incomplete. A footnote in the report explicitly says as much, though Adams’s tweet omitted that detail. In Denver, where most black people in Colorado live, data painted a different picture. Police there reported that arrests of black youth plummeted by 75%. “As a matter of routine, if you give data to someone impactful like a Surgeon General it should be triple checked for accuracy and complete notation,” she added. Contacted by Leafly News, a spokesperson for the Office of the Surgeon General did not address either Adams’s misstatement nor his choice to publicize misleading data from an anti-marijuana activist group. She did not immediately respond to further questions. Adams’s tacit endorsement of SAM data was only the latest in a string of tweets that contained questionable or debunked claims regarding cannabis. All of them have since been contradicted by data provided by academics and researchers. Studies making such claims have been “completely discredited,” said Dr. Peter Grinspoon, a Boston-area physician who teaches at Harvard Medical School. “Why is the surgeon general making random, misinformed statements about cannabis?” Grinspoon asked. As for having Project SAM data cited when Adams’s claim was challenged: “It’s like having the Flat Earth Society joining a conversation about geography,” he said. But apparently you can ignore well-researched reports that contradict that claim. After all, Adams himself did exactly that. Barely two months earlier, the RAND Corporation had released a report concluding the opposite had happened in Washington state. Youth cannabis use had fallen since legalization, the report found—though researchers also called for the use of better data to follow the changing trends. In Colorado, data from that same survey found that youth cannabis-use rates were either unchanged or had fallen to decade-low levels following legalization. All of which raises the question: Why would the nation’s top public health official choose to publicize disinformation? Whether it’s representative of an institutional bias in Washington, DC, or a warning of what’s to come from the Trump Administration, experts contacted by Leafly News couldn’t say for sure. Some called it yet another example of an “alternative”—that is, false—assertion from Team Trump. Original Post: Leafly: The US Surgeon General Just Tweeted WHAT About Cannabis? In lockstep with a growing number of legislators across the country, Republican state lawmakers in New Mexico want recreational marijuana to be legally sold in stores, but with a unique big-government twist: in what would appear to be a first in the United States, they’re proposing that the state government own and operate cannabis dispensaries. Medical marijuana has been legal in New Mexico for more than a decade, but with new Democratic Gov. Michelle Lujan Grisham’s encouragement, legal cannabis commerce is growing significantly—and is accompanied by a growing chorus in support of outright legalization. A bill in the state House of Representatives backed by Democrats, which would legalize marijuana for all adults 21 and over, was recently approved by a committee. As the Santa Fe New Mexican reported, a competing marijuana legalization proposal in the Senate, introduced on Thursday by Sen. Mark Moores (R) and co-sponsored by two colleagues, including a Democrat, would follow a similar model to how alcohol is sold in at least two other U.S. states. In Utah and New Hampshire, hard alcohol is available only at state-run liquor stores, Moores told the newspaper. Pointing out the obvious—New Mexico is next door to Colorado, where recreational cannabis has been legal for half a decade, and where border towns like Trinidad, Colorado have dozens of marijuana retail stores catering to visitors from other states like his own—Moores observed that legalization is inevitable. It wasn’t immediately clear what benefit—aside from putting a serious kibosh on the prospects for a marijuana industry in New Mexico—Moores hopes to provide by limiting sales to government-run outlets. In Canada, where recreational marijuana went on sale in October, some provinces, including New Brunswick, allow sales only at government-run retail locations, according to CBC. Other provinces allow private commercial operators to sell marijuana online and at brick-and-mortar locations without appreciable ill effect. In Uruguay, legal marijuana sales are limited to private pharmacies as opposed to separate, marijuana-only retail stores. The New Mexico proposal would be a new model for the United States. In nearby Nevada as well as California, Washington, Oregon and Alaska, where recreational marijuana is legal and available in stores, it’s sold at government-regulated, privately run businesses. The closest analogue seems to be found in North Bonneville, Washington, which is the first and only city to open a government-run dispensary in the country. Faced with the prospect of bankruptcy, the city’s mayor launched the cannabis shop in a last-ditch effort to amass badly needed revenue. In New Mexico, excluding entrepreneurs like Duke Rodriguez, president of Ultra Health LLC, the state’s largest medical marijuana company, seems a discordant move for an ostensibly business-friendly Republican. New Mexico has been a reliably blue state in recent presidential elections, but like many other states in the West, it also has a deep, small-government libertarian streak. With that in mind, Rodriguez isn’t sure if New Mexico’s state government is up to the task of running what’s become a billion-dollar industry in other states. New Mexico Republicans Say Legalize Marijuana, But Let The Government Sell It was posted on Marijuana Moment.